"We have informed our Executive Board that Greece is now in arrears and can only receive IMF financing once the arrears are cleared," said IMF spokesman Gerry Rice. Mr Rice confirmed the IMF had received a request from Greece to extend the payment deadline, which he said would go to the board "in due course". 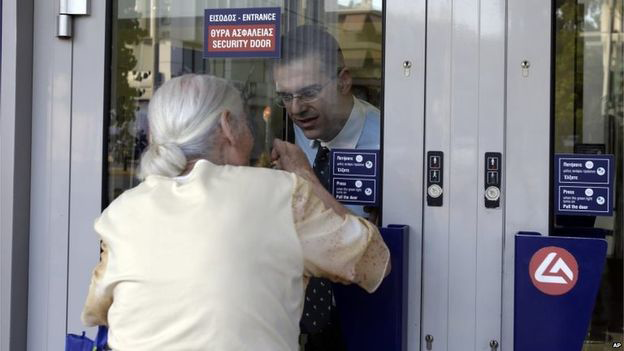 The European Central Bank (ECB) has also frozen its liquidity lifeline to Greek banks. 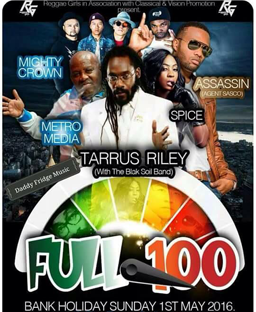 Meanwhile, ratings agencies have further downgraded the country's debt. This is not how international diplomacy or finance is supposed to be conducted: a series of confusing last minute proposals in an atmosphere of mounting chaos. Without another bailout, Greece is in dire straits - cut off from all international financing, and skating on dangerously thin ice. If it can't repay a debt to the ECB on 20 July, that would probably be the end. It is running out of options to keep it in the eurozone. Part of the new deal Greece has suggested would involve a restructuring of its huge debts - but some of its proposals will not be acceptable to other eurozone countries. So there is uncertainty at every turn, and plenty of public posturing as Greece prepares for a referendum on Sunday. Just to confuse matters still further, some EU officials have suggested that there have been indications from the Greek authorities that if the outlines of a deal can be done in the next couple of days, the referendum could even be cancelled. Eurogroup chairman and Dutch Finance Minister Jeroen Dijsselbloem earlier said it would be "crazy" to extend the Greek bailout beyond its Tuesday deadline as Athens was refusing to accept the European proposals on the table. Speaking after the conference call with other eurozone ministers, Mr Dijsselbloem said that a Greek request for a new €29.1bn European aid programme would be considered in a telephone conference on Wednesday. BBC economics correspondent Andrew Walker says he understands Greece may submit new proposals on Wednesday that rein in its spending. 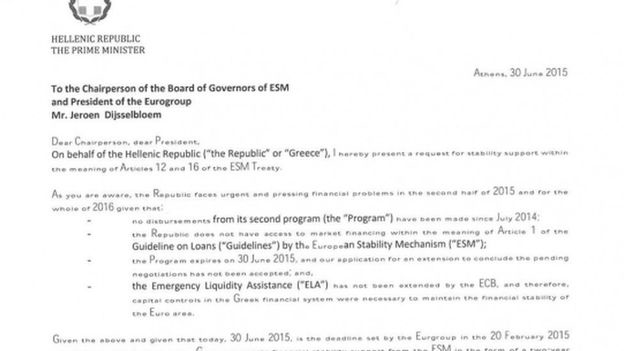 Greece's request on Tuesday asked for funds from Europe's bailout fund - the European Stability Mechanism - as well as a restructuring of Greece's public debt. But German Chancellor Angela Merkel earlier said she had ruled out further negotiations until after Sunday's referendum, which will ask Greeks if they want to accept the deal offered by their creditors. Meanwhile, the US Treasury said on Tuesday it was urging all parties to press forward with negotiations "that put Greece on a path toward economic growth within the eurozone". The European Commission - one of the "troika" of creditors along with the IMF and the eurozone's European Central Bank - wants Athens to raise taxes and cut welfare spending to meet its debt obligations. Ratings agency Fitch cut Greece's credit rating from "CCC" to "CC" on Tuesday evening, which is one level above a full default. 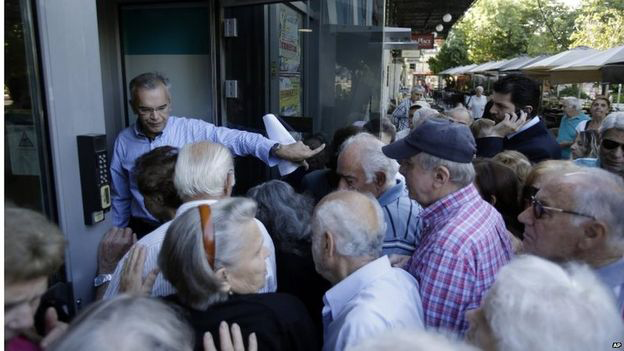 Fears of a default on Greece's huge public debt of €323bn have led to long queues of people at cash machines. Withdrawals are capped at just €60 a day. 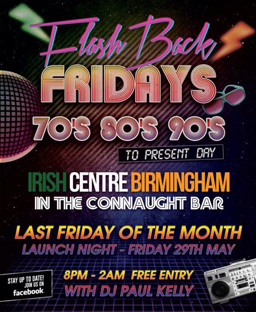 However, up to 1,000 bank branches are re-opening on Wednesday to allow pensioners - many of whom do not use bank cards - a one-off weekly withdrawal of up to €120. 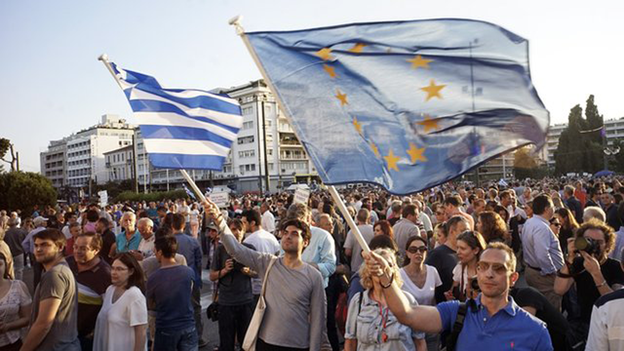 On Tuesday evening, thousands of pro-EU protesters braved stormy weather and gathered outside the Greek parliament in Athens to urge a 'Yes' vote in a referendum on Sunday over whether the country should accept its creditors' proposals. 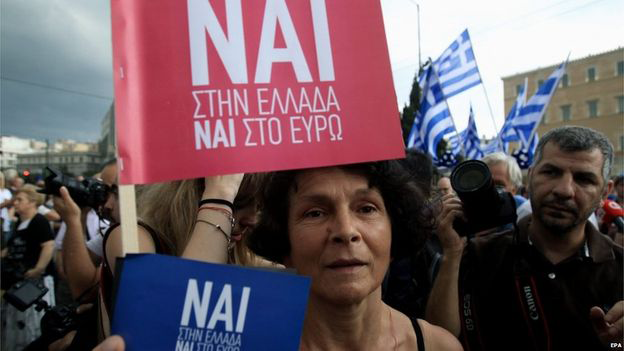 It follows a similar demonstration by those advocating a 'No' vote - the path preferred by Mr Tsipras - on Monday. EU leaders have warned that a 'No' vote rejecting creditors' proposals would mean Greece leaving the eurozone - though Mr Tsipras says he does not want this to happen. The ECB is believed to have disbursed virtually all of its emergency funds for Greece, amounting to €89bn (£63bn). Only three other countries are still in arrears to the IMF - Sudan, Somalia and Zimbabwe. 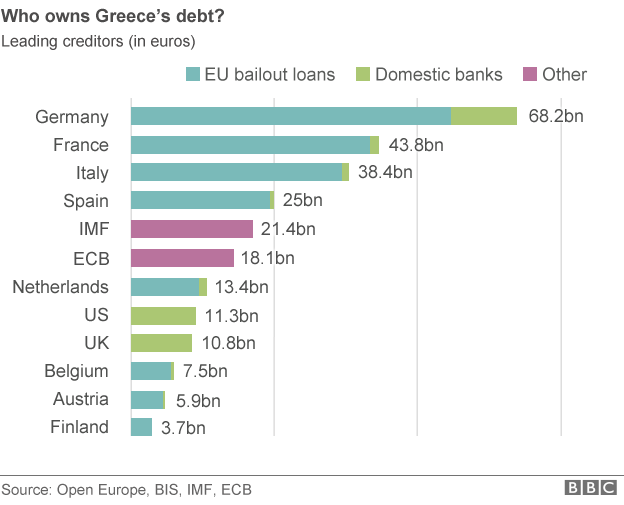 Between them, they owe €1.6bn, only marginally more than Greece.